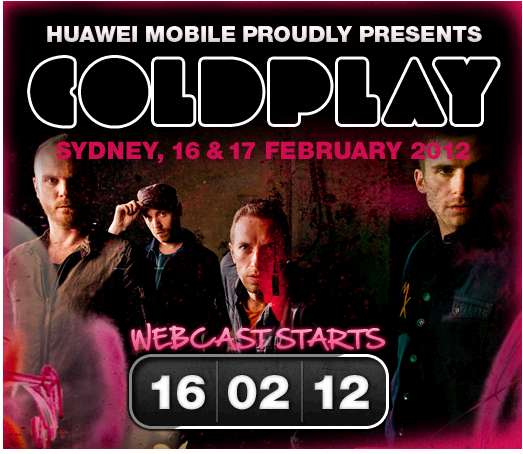 Coldplay announce a two day Australian promotional visit to Sydney on Thursday 16th February and Friday 17th February. Direct from performing live at the 54th Annual Grammy Awards on Sunday 12th February, Coldplay will play two intimate performances in Sydney. Fans will have the opportunity to see Coldplay like never before at these two exclusive, “money-can’t-buy” events. The first is a 2Day FM & Huawei Mobile Live Set With Coldplay on Thursday 16th February, where an audience of 30 competition winners will get up close and personal with the band while they play live on 2Day FM. Selected winners will also receive a Huawei mobile to record their experience and share with their friends via social networking on the day. For those who miss out, Huawei Mobile will be live streaming the performance on their Facebook page at www.facebook.com/huaweimobile, or you can head to 2Day FM’s website at http://www.2dayfm.com.au to watch. Fans have a second chance to catch the band while they’re in town at Sunrise & Huawei Mobile Present Coldplay Live on Friday 17th February. As well as being broadcast on Channel Seven, this event will stream from Huawei’s Facebook page. For a chance to win tickets to see Coldplay at one of these special events, head to www.facebook.com/huaweimobile, tune into Sydney’s 2Day FM, and watch Seven’s Sunrise. 7 time Grammy winning Coldplay have sold over 50 million albums in their career. They last visited Australia in 2011 for a triumphant set at Splendour In The Grass before releasing their fifth album Mylo Xyloto which topped the charts in 34 countries worldwide, including Australia. As Mylo Xyloto officially hits double platinum sales in Australia this week, the band’s current single Paradise has surpassed triple platinum status and is currently the No.1 most played song on Australia radio. Paradise is now Coldplay’s most successful song to date in Australia! Paradise is currently No.5 on the national ARIA singles chart, with Mylo Xyloto sitting at No.7 on the ARIA album chart. Coldplay head straight to London from Sydney to perform at the Brit Awards ceremony on Tuesday 21st February where they are nominated in two categories – British Group and British Album Of The Year.